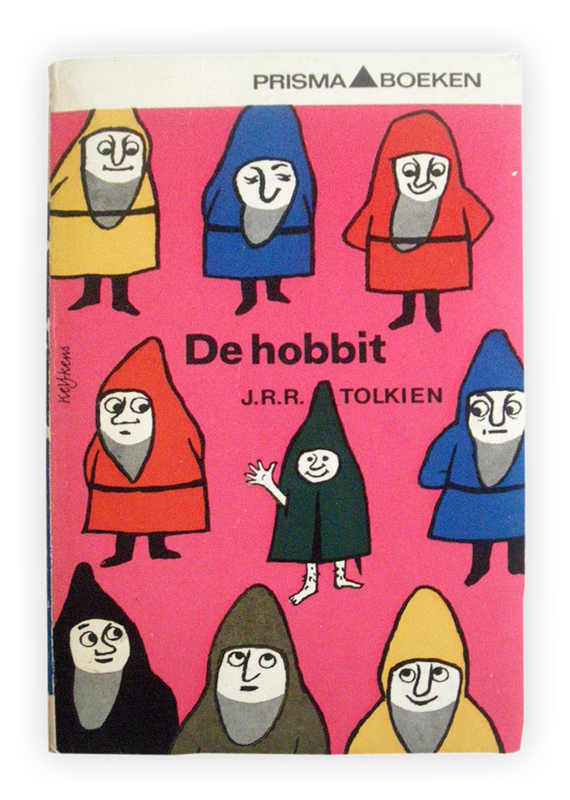 De Hobbit, Dutch paperback edition (1967) | 'TAIN'T THE MEAT… IT'S THE HUMANITY! Featuring artwork by illustrator Cees Kelfkens this charming dutch edition of JRR Tolkien’s The Hobbit was originally published in 1960. The edition I have is a reprint from 1967 released by Prisma-Boeken. Kelfkens, a renowned illustrator and graphic designer who passed away in 1986, did a wonderful job with this cover. His painting firmly reminds the reader that The Hobbit was a story for children (something director Peter Jackson seems to have forgotten with his overblown epic adaption) and the artwork has a cheerful, friendly feel to it. I love the bright primary colours and how a grumpy dwarf (Thorin, I suspect) glares down disapprovingly at the waving Bilbo. Kelfkens artwork must have proved popular as it graced the cover of the book for over a dozen reprints, right up until the mid-1970’s. It’s easy to see why.